Mitchell's plan of the city of Chicago, Illinois. 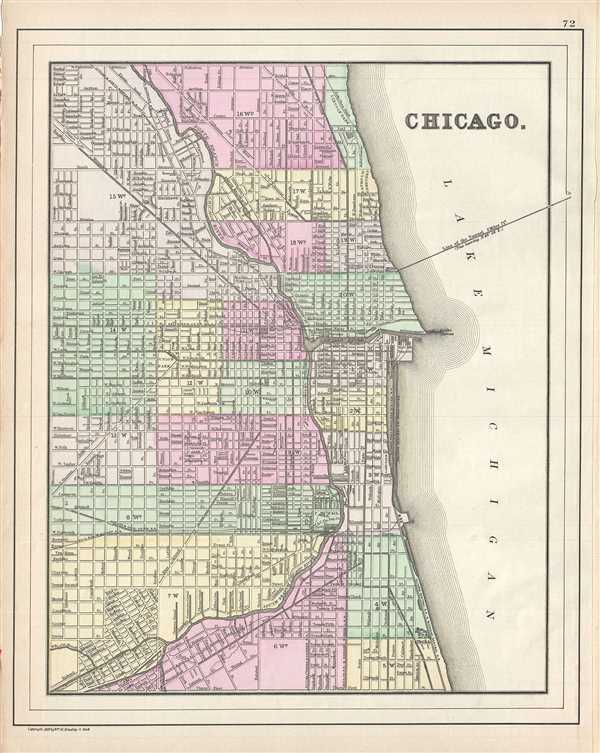 This hand colored map or plan of the city of Chicago dates to 1890 and was issued by the important American map publisher Samuel Augustus Mitchell, the younger. It covers from thirty first street northward to Fullerton Avenue. The map covers the city in considerable detail, noting rivers, parks, individual streets, railways, tunnels, and other important information. Prepared for inclusion in the 1890 issue of Mitchell’s New General Atlas. Copyrighted 1887 by the engraver and printer, Wm. M. Bradley and Bros.
Mitchell, S. A., Mitchell's New General Atlas, 1890.